Capcom has confirmed Devil May Cry 5 will release on March 8, 2019 at Microsoft’s Gamescom Inside Xbox live stream. Previously, we only knew the title would release in 2019. Devil May Cry 5 is the latest addition to the slack n’ slash Devil May Cry franchise. Though little details are known about the story, we do know it is a direct sequel to Devil May Cry 4 and Dante, Nero and Vergil will all be making a return.Capcom has promised more details will be revealed at Tokyo Game show in September. After much speculation, Devil May Cry 5 was officially revealed during E3 2018. 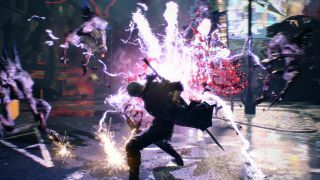 It’s been 10 years since the release of Devil May Cry 4, but director Hideaki Itsuno has once again returned to the helm of the demon-slaying series. Devil May Cry 5 will release on March 8, 2019 for Xbox One, PlayStation 4 and PC.